When Nick and I got married, we thought about having our best man, our friend Will, also be our officiant, but ended up deciding against it because we knew being the best man was already a tall order, and didn’t want to have to add the stress of the ceremony to his to-do list. A good friend and pastor at our church was able to officiate our wedding, and that was important to us. 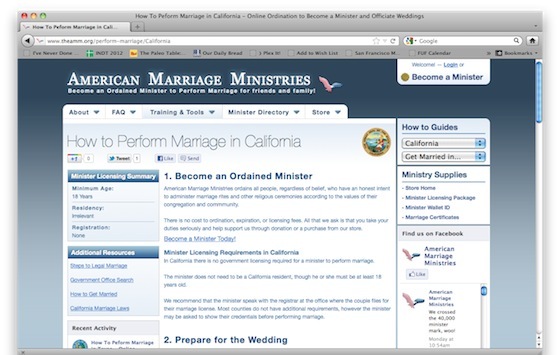 Will is not a pastor, but he’s been ordained to officiate weddings, and has performed several. Our cousin Mark has also been ordained to officiate weddings, and has performed several as well, including those of some of our other family members. So cool. While it’s kind of a joke on TV, like the Friends episode where Joey is the officiant for Monica and Chandler’s wedding while wearing an army uniform, or Barney on How I Met Your Mother (the hugest womanizer on the planet in the show) performing Lily and Marshall’s ceremony, in real life it is a fantastically beautiful thing to have the person who officiates your wedding ceremony to be someone you know, love, and respect. While for many people that person is their pastor or a reverend at their church, for many others who aren’t affiliated with an organized spiritual group, the idea of hiring an officiant (who neither person knows) is a formality that can feel strange. Why should someone who you have no history with be the one who facilitates the ceremony in which you and your partner in life celebrate your love and union? So today being Leap Day, I thought what better way to celebrate this special extra day than to get my officiant’s license, to be able to help people in love take the leap into life together? 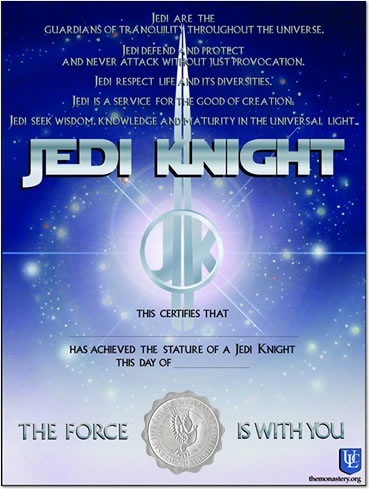 While of course, I was tempted by the calling to be certified as an ordained Jedi Knight (for only $10.99), American Marriage Ministries seemed like the best choice – they weren’t all about selling crazy stuff, they had a lot of good information on performing ceremonies, and even had tailored instructions on what you need to provide to the local government offices depending on what state you’re in. 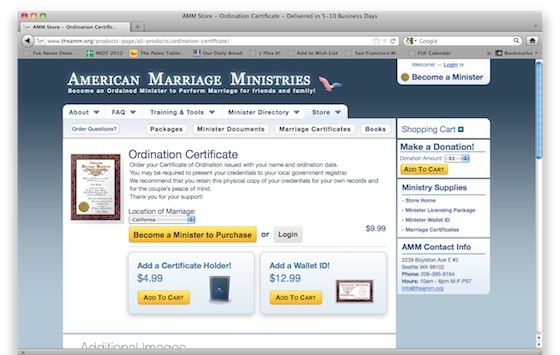 In some states, you need a Certificate of Ordination to show the local government offices when your name appears on the marriage license as the officiant. If you need this, you can buy one from AMM, but I appreciated that they make it clear that you don’t need to buy anything from them unless your local offices need this documentation from you. Some states also require a Letter of Good Standing from the organization that ordained you, so they have those available as well. 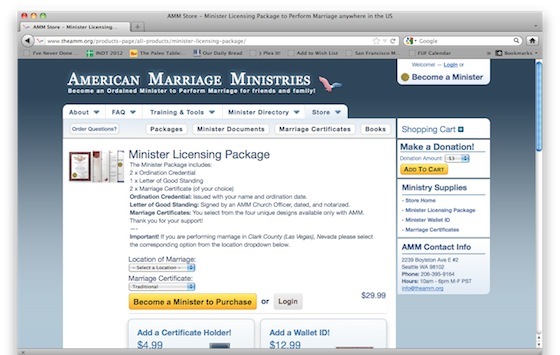 I liked that if you needed them, you could purchase these items individually according to what your situation is, and that the AMM site didn’t seem to be about merchandising as much as it was providing information about performing weddings. They do also have special packages that include all the documentation you might need, plus marriage certificates for the couple to keep; until Nick and I got married, I never realized that unless you have your own special marriage certificate to fill out along with the legal form on the wedding day, you have nothing “official” to take home with you (the marriage license gets sent in to be processed). Unless you request (and pay for) a copy of your legal marriage certificate, the only one that exists is the one on file at your County Recorder’s Office (how romantic). 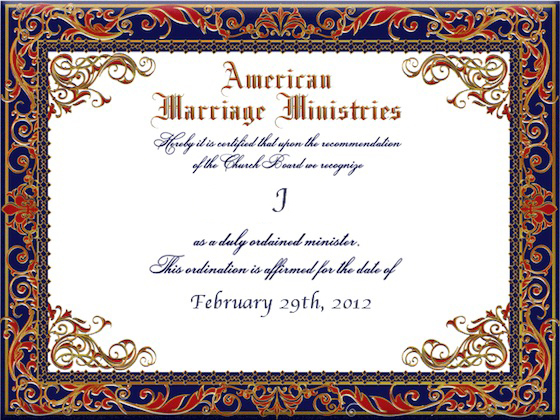 After filling out their short information form and clicking the “Ordain Me!” button, I became ordained to officiate weddings. 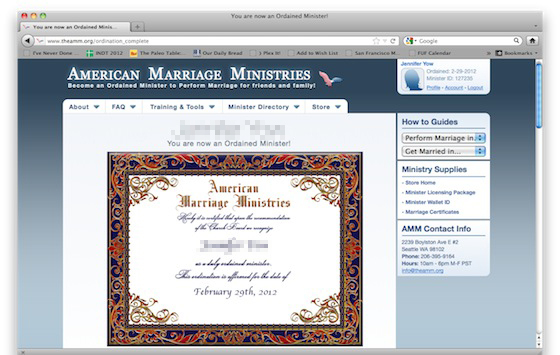 I am now on the registry as such on the American Marriage Ministries website. Crazy! But really cool. Happy Leap Day! May the Force be with you.